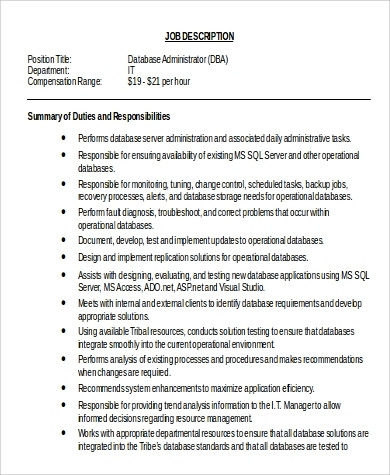 A database administrator is typically a software specialist responsible for maintaining and troubleshooting a company database as well as securing backup and data recovery. 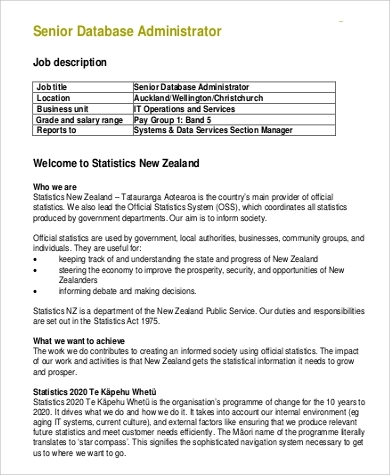 Database administrators are normally graduates of a Computer Science course and must be up to date regarding changes in new technologies and should be experienced in database management systems (DBMS). 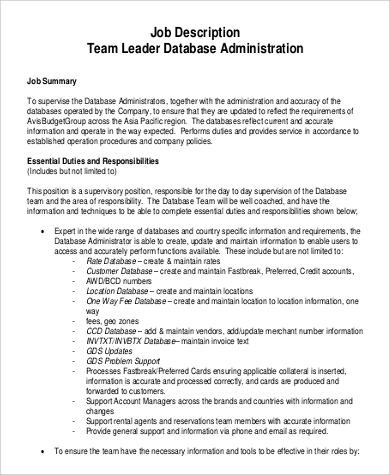 Our database administrator Job Description Samples cover a wide array of descriptive titles any institution or company needs to meet their requirements for a competitive data administrator with the right skills for the job. 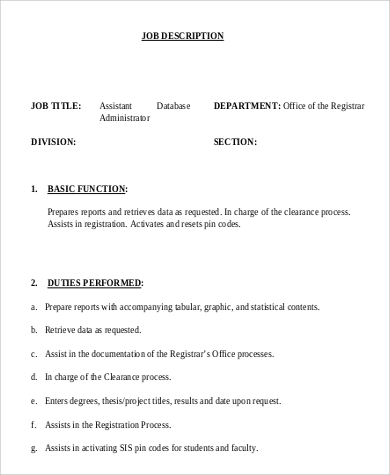 The qualities and duties are outlined as guides to attract the most skillful database administrator applicants, and the forms are easily downloadable and printable in Word Doc or PDF file for ease of use. 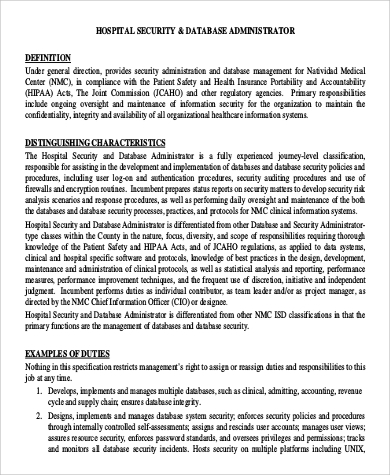 Duties and responsibilities include developing, maintaining and designing new programs conformable to the company’s system; extensive analysis of processes; programming and finding ways and recommendation for systems development. 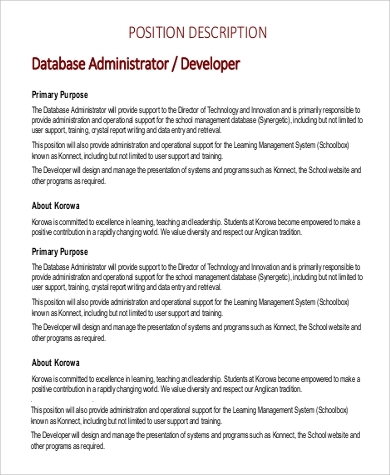 These are just a few examples of database administrator job samples available here for downloading. 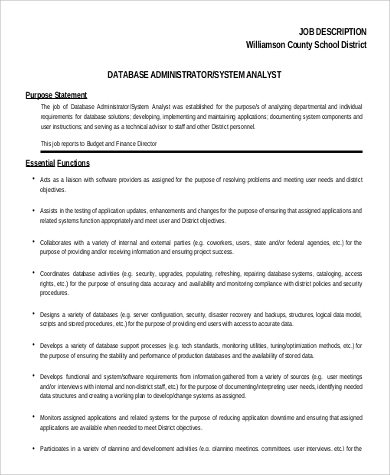 For specific job offerings in this field of work, our System Administrator Job Description Samples can be used for reference to help you outline the exact objectives for job postings. 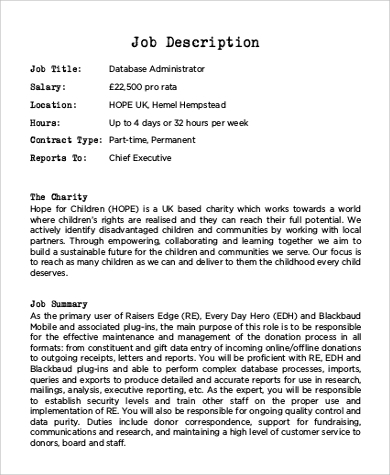 For the samples related to this field, the forms are made to be modified or edited to fit the precise job posting requirement. The links are provided for easy reference and you can choose either Microsoft Word Doc file or the Adobe Acrobat Portable Document Format (PDF) file. Please note that PDF files may be harder to edit than the usual Word Doc file. 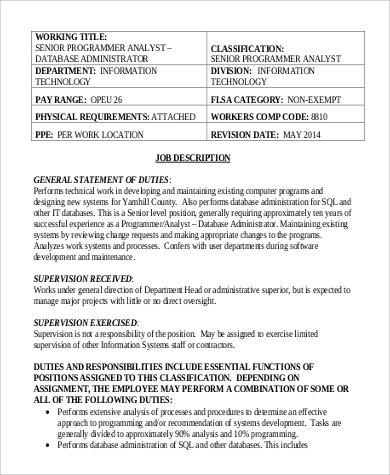 Being a database administrator entails a lot of computer-related tasks that would normally boggle the minds of those not familiar with computer software-related complexities. The list of primary tasks alone is one where only the ones familiar with database management systems can understand. Things like modifying database structures and upgrading database server application tools are just one of the many delicate tasks included in a database administrator’s job. System security is also one of the essential duties of a database administrator to prevent hackers from accessing sites, which can compromise operations and lead to complicated problems. 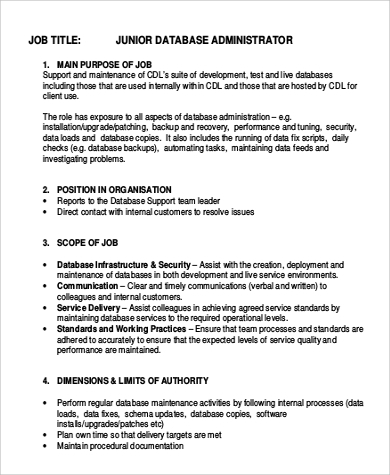 Our series of downloadable Job Descriptions will make it easy for companies to define the duties and tasks needed for any specific database administrator jobs for proper selection. These are available in either Word Doc or PDF files.